MINNEAPOLIS (August 21, 2017) – After more than 60 years away from professional flat track racing, Indian Motorcycle has won the 2017 American Flat Track Manufacturer’s Championship after a second-place finish at the Peoria TT. American Flat Track recognises Manufacturer Champions in each class of racing. The manufacturer that accumulates the most points in each class over the course of a season is declared the Manufacturer Champion. With four races remaining, and Indian ahead of the next manufacturer by more than of 100 points, Indian Motorcycle has won the titles of Manufacturer Champion. Aboard the Scout FTR750, the Indian Wrecking Crew have been on the podium 30 times out of the season’s 42 total podiums. Jared Mees, the season’s point leader, holds a 41-point lead ahead of Bryan Smith, while Brad Baker rounds out the top three in the season’s standings. 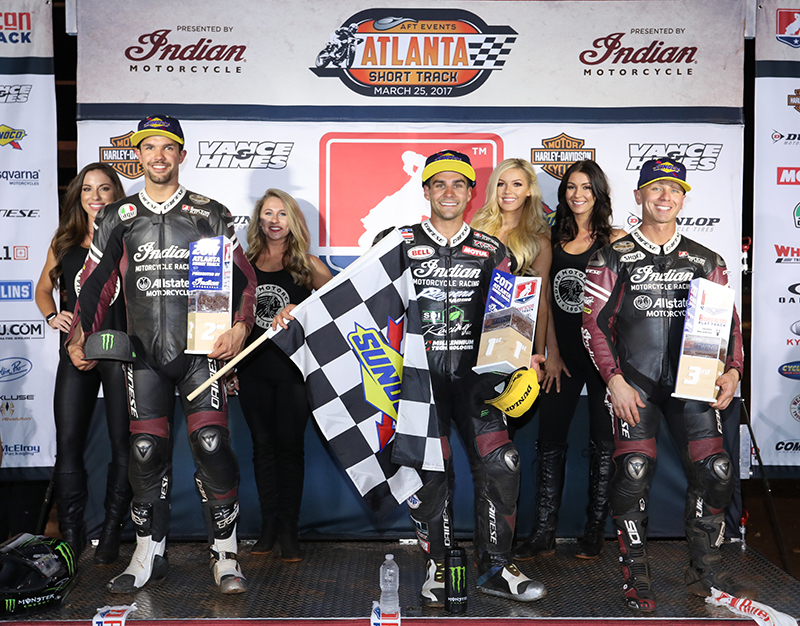 Jared Mees and Bryan Smith have tallied 11 first-place finishes, with seven going to Mees and four to Smith.